John Sloan's interest in the working class was not only aesthetic, it was also political. By 1909, Sloan was an active member of the Socialist party and used his art to shine a light on the equally noble and interesting lives of the lower classes. Marrying style to subject, Sloan's loose brushwork and dark colors epitomize the Ashcan style. In 1909, many artists and collectors would not have considered a Chinese restaurant to be an appropriate subject for a painting. 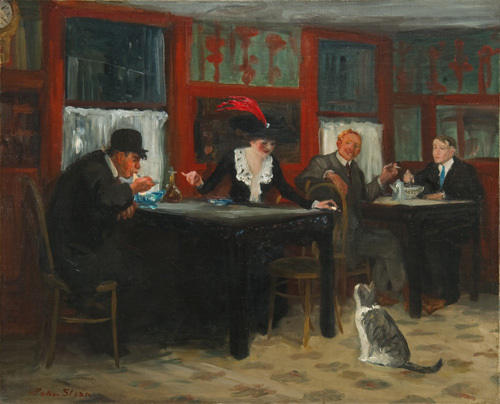 The artist, John Sloan, was part of a group of artists labeled "Ashcan" painters early in the century, because of their frequent choice of the less genteel aspects of urban life. Now, Sloan's paintings are recognized as major documents of American life and this painting, like many others on view in this installation, is often loaned to museums in the United States and overseas. Also called "The Eight," Sloan and his seven colleagues exhibited together in a landmark show at Macbeth Gallery in 1908 in response to the jurying system of the National Academy and its more traditional members that frequently excluded less conventional artists. It's amusing to consider that in 1943, when the Encyclopedia Britannica collection was being assembled, that a painting created in 1909 would be considered contemporary. However, it may have been included in recognition of the fact that John Sloan painted his contemporary world as he saw it. In fact, in 1943, the freshness of Sloan's style and the timeless nature of the scene painted thirty-four years previously did not seem out of keeping with many works from the 1940s. And Sloan was still quite an active artist at this point in his life. As recommended by his mentor, painter Robert Henri, John Sloan derived most of his subjects from close observation of his surroundings. Such was the case on the night of February 23, 1909, when he went out to eat at a restaurant on Sixth Avenue, not far from Herald Square. He wrote, "I saw a strikingly gotten up girl with dashing red feathers in her hat playing with the restaurant's fat cat. It would be a good thing to paint. I may make a go at it." Characteristically, Sloan waited for a bit before undertaking the work, and on March 15 wrote, "I started a memory painting of the Chinese Restaurant girl I saw some four weeks ago." His intermittent working style is revealed by a diary entry on March, 18, in which he described not only working on the painting, but going to the restaurant again to "refresh my memory of the place." In 1944, the painting joined a corporate collection of outstanding contemporary art formed by the Encyclopedia Britannica. In 1951, the Memorial Art Gallery acquired fourteen paintings from the collection - this painting and work by Thomas Hart Benton, Georgia O'Keeffe, and Stuart Davis, among others.